On this island, there are seventeen children under the age of five, who suffer from malnutrition, said Lepani, the nurse practitioner on Cicia Island. My husband, Peter, and I on board our boat "The Southern Cross" were visiting this remote island in the Northern Lau Group of Fiji. We were collecting information regarding the impact of Cyclone Winston, under the umbrella of Sea Mercy, along with the crew of two other vessels. 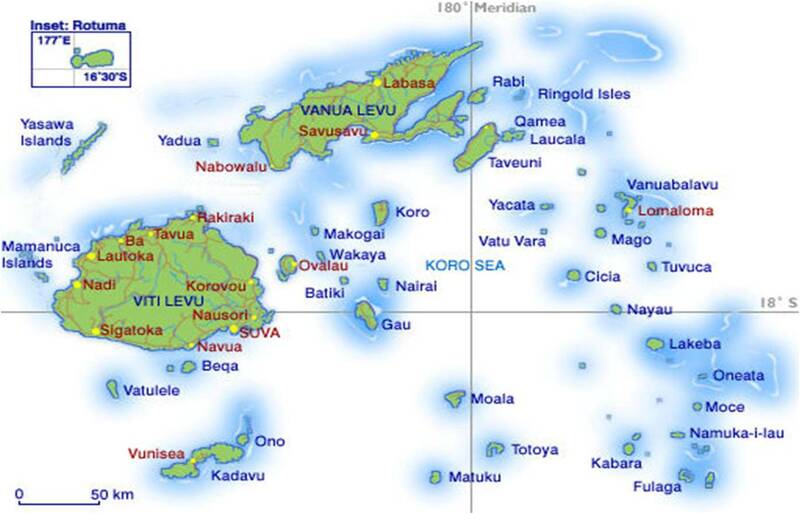 Cicia Island is home to 1,100 people. Food crops, both above and below ground, as well as their cash crop, copra, were destroyed. There is no money coming in without copra to sell and there is not enough food to last them until their newly planted crops start producing. One of the babies who is severely malnourished has a particularly sad story, continued Lepani. The babys father was killed last week by a wild boar when he was out hunting for food for his family. The following day, Peter and I, along with Matt from the sailing vessel "Perry", visited two other villages. We were transported by truck along the islands perimeter track. Our driver, Singa, showed us photographs of the wild boars victim. You can see he lost a lot of blood. "The wild pigs tusk got him here", he said indicating his groin and femoral artery. "We heard that this man was late home, so we went out searching for him but it was too dark, so we had to wait 'til the next morning. That's where we found him", said Singa pointing across the valley. "When men go out hunting they take their dogs with them. That's how we able to find him - his dog was still standing guard." Did he have a gun? asked Peter. "No, only a knife." How old was he? I asked. "Only 28", said Singa shaking his head. Only 28 and two young children. Before we reached the village of Lomoji, Singa stopped the car. This is where the young man was buried five days ago. Singa pointed to a highly decorated grave which sat nestled beneath cyclone ravaged pines. Through the kindness and generosity of strangers, Sea Mercy is assisting the people of Fiji, including the community in which this dead mans two little children live. People living on islands ravaged by Cyclone Winston need help to obtain proper nutrition until they can recover from this disaster. What has been done already: Thanks to donations provided to Sea Mercy, we were able to deliver cans of food, bags of rice and building materials to the peoples of Cicia Island. Other Sea Mercy volunteer sailing vessels have delivered aid across the Northern Lau region, again thanks to donations to Sea Mercy. Enough food (including baby formula) to sustain the people over the next several months until their crops regenerate. Even now, almost 4 months after Winston devastated Fiji, we are seeing many people in the remote islands still in desperate need of help. They lost their homes, fresh water storage, food source and their income all in one storm. 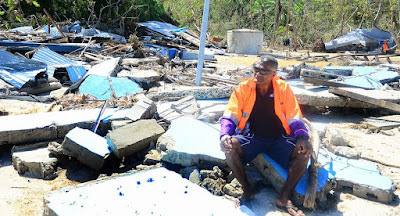 The people of Fiji are incredibly resilient and independent but have suffered such a severe loss that they will need help from others to be able to rebuild their lives. The Sea Bridge for Fiji page on the Sea Mercy's website describes the recovery plan in detail as well as how you can help. Please read about our plans to help Fiji recover and find a way you can help them get back on their feet.